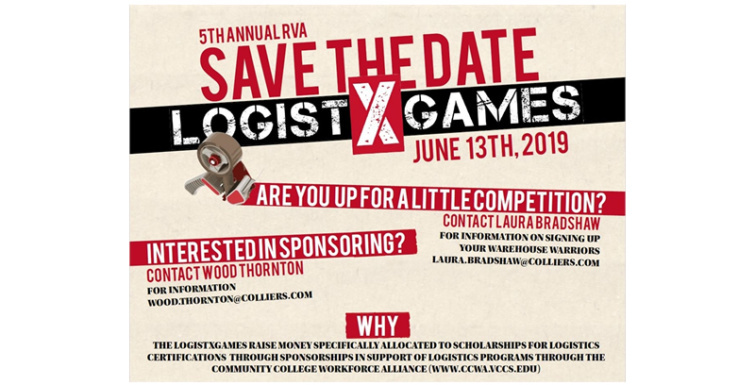 CCWA is excited to partner with Colliers and other industry partners to host the 5th Annual Logistx Games to be held Thursday, June 13, 2019 (Location – Richmond Distribution Center. 4000 Carolina Ave, Richmond, VA 23222). The competition allows local logistics teams to showcase their skills and expertise in the supply chain and distribution industries – packaging and moving goods from warehouse to consumer. The logistics industry is very competitive in Central Virginia, and the employees are the backbone of each company. The LogistX Games honors those companies and employees, while building awareness for new talent to enter the industry. Sponsorship opportunities available! Get Sponsorship Form here (PDF). Sponsorships will be used for scholarships for job seekers entering the Certified Logistics Certification program (CLT). These funds will directly benefit employers and job seekers by decreasing the skills and employment gap within the logistics industry. CBRE|Richmond, The Port of Virginia, Virginia Credit Union Arbon|Rite Hite, Panattoni, Capital Region Workforce Development Board, Becknell Industrial, Liberty Property Trust, Alpha Systems, Chesterfield Economic Development, Crown Lifts, Dominion Energy, Greater Richmond Partnership, Hanover County Economic Development Authority, Henrico County Economic Development Authority, Hood Container, Hourigan Development, Lutron, Manufacturing Skills Institute, Peaklogix, Potbelly Sandwich Shop, Richmond Economic Development Authority, Riverside Logistics, SignCrafters, TK Promotions, Total Packaging Services, Williams Mullen and Worth Higgins & Associates. Tax deductible contributions will be designated for workforce development efforts including logistics/operation management industry training offered by CCWA. To register your team, contact Laura Bradshaw at laura.bradshae@colliers.com. For sponsorship information, contact Wood Thornton at wood.thornton@colliers.com.